If you look around yourself carefully, you may notice that our Universe consists of a unified network of systems nestled within systems. Your physical body is composed of various organ systems, each maintained by groups of cells, molecules and atoms. Our families and social communities are embedded in ecosystems, the biosphere, the solar system, our galaxy and the universe. From this perspective, human beings are as much a part of nature as the oceans, trees, and stars. What’s more, there seem to be certain patterns and processes which occur in natural systems everywhere, guiding the development of individuals and galaxies alike. The ideas in systems theory are based on careful observations of natural phenomena. They tell us how nature works, how all things fit together into larger systems and communities. Its concepts refer as much to cells and solar systems as to nations, corporations and basketball teams. While many of the words and concepts of systems theory are new, systems thinking is not. 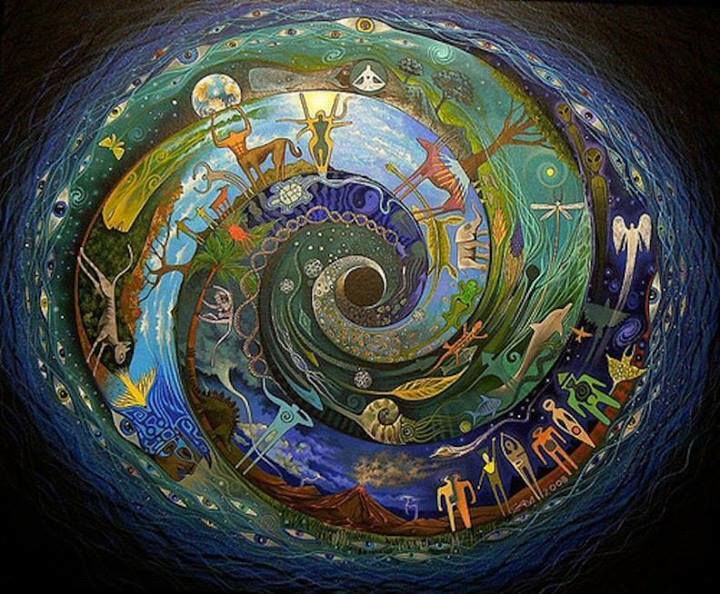 Systems thinking is a way of looking at the world ecologically and holistically, where one focuses on patterns, connections and processes, and how seemingly separate things form coherent wholes. Systems thinkers have been with us since ancient times, providing wisdom and guidance in all cultures and every area of human activity. Some of the ideas presented here have their roots in ancient Greece, or in Eastern systems of thought, such as Taoism or Zen. Many indigenous communities have long had an awareness of the way nature’s systems worked. They observed their environments carefully, watching the ways animals lived, how the natural world moved in cycles and patterns. Elaborate myths and rituals have helped native people to align themselves with the rhythms and processes of nature, to feel a part of their local worlds. On the other hand, many civilized societies have moved away from a feeling of connectedness with nature, and an understanding of nature’s ways. In the West, we have developed more dualistic ways of thinking, classifying and categorizing everything in the world. Our cities and communities both reflect and influence this thinking. Ours is a world of walls, boxes, and roads, of separation and specialization. Our social institutions are organized by a more mechanistic and linear paradigm, a less organic beat. As the industrial revolution took hold in communities across the globe we have used this paradigm to organize all areas of our lives. In our educational institutions we have removed children from their families and natural surroundings. We have put them together in rooms and then asked a single adult to provide them with disconnected facsimiles of the world, to divide external reality into separate fields such as art, science, language, and history. What is often ignored in this approach is the way these different phenomena are related, how things often flow together and influence one another. In a field like science the natural world has been further divided into pieces. When we were young we studied biology, chemistry, physics, and geology– as if each field existed separately from the others. We never received a coherent picture of the world that reflected the way nature actually organizes things, how these phenomena are related to one another and play a role in each individual’s life. Lacking a unified understanding of nature, our scientists and educators have often used very misleading metaphorical language in order to describe the world. Over the last few hundred years, leading Western scientists have talked about nature as if she were a woman to be dominated, a mindless machine, a struggle for survival, or (at best) a “glorious accident.” These metaphors have influenced the way modern nations have dealt with internal social problems, other communities, and the natural world. In the United States, social or physical problems have often been viewed as adversaries people must struggle with or declare war upon. This dualistic thinking underlies the approaches we’ve taken toward poverty, drug abuse, cancer, and crime. It has sent missles firing into Viet Nam, Lebanon, Panama, Libya, Afghanistan, Pakistan and Iraq. In most cases our wars have been ineffective, created new problems, or simply ignored the resulting violence and suffering caused. Yet, while this hard-edged thinking may be out of touch with the organic complexities of natural phenomena, it has provided the key to the development of sophisticated tools, mathematics, and machines. New inventions (like the microscope, the camera, the steam engine and the computer) pushed change and shaped the unfolding patterns of mechanistic civilizations. They also allowed scientists to observe the rhythmic functioning of atoms, organs, and cells; to glimpse the history of our planets and the stars. It is in this careful and methodical examination of the natural world that modern systems theory developed. Today we have detailed information about almost everything in the observable universe. We also have a large body of words, concepts and theories that describe how all these things fit together, how these systems provide evidence of certain recurring processes and patterns in the natural world. Setting out initially to classify and categorize nature, science has now brought us full circle, rediscovering Nature’s Paradigm. The second part of this essay is here: Nature’s Paradigm: The Core Ideas of Systems Theory. The text is from an article I originally wrote in 1996: “Systems Theory: Rediscovering Nature’s Paradigm” Full pdf file can be downloaded from here. This entry was posted in Creative Systems Thinking and tagged christopher chase, connectedness, creative by nature, creative systems, creative systems thinking, creative universe, ecology, interdependence, nature, nature's paradigm, new paradigm, systems thinking, tao, wisdom, world peace, zen. Bookmark the permalink. Excellent piece on scientific advancement, first leading away from nature, with rigidity and dualism, now a rediscovery and coming full circle. Cristopher, do you know the cradle to cradle concept? Hi. I don’t think so, though its possible that I do. What is it? Reblogged this on LOB's Metier. Interesting summary I look forward to the follow up. I appreciate the narrative nature, it inspired some reflection of my journey through systems theory. For my learning it would be nice to see a connection between the narrative and systems theory terms (i.e positive/negative feedback, leverage points). Organized religion is a connection to dualistic thought (and power and control) that pre-dates industrialization. Be nice to see a connection to eco-theology and dogmatic interpretations of Christianity. Also corporatization and disassociation of the economy from the earth’s resources. Thanks for sharing, appreciated. Hi Kimberly, yes, all that you mention is connected in some way. This was a short summary so much is left out, but I try to address as many related issues as I can here on my blog and Facebook page. From this point of view, connectedness reigns! Really wonderful essay Jenn, thank you!!! We are all as much extraordinary phenomenon of nature as trees, clouds, the patterns in water, the flickering of light, the arrangement of stars, the form of a galaxy. We are all just like that, and there is nothing wrong with you at all! May I re-post ‘Rediscovering Nature’s Paradigm, Part I’ as a Whole Human blog post, with acknowledgement? My email for a response is emanatepresence at live dot com. My ruminations start the blog and your article follows in full, with credit and links back to you. Thanks Gary. 🙂 Will look soon. With all that is understood about connectedness, oneness, unity, union, where is it being lived? Do any of those words express the most potent understanding of the underlying nature of reality? Emphasis is still placed on separate identities, linking hands and singing so to speak. Then there is ‘we are all made of the same God material’ and ‘we are one in Spirit.’ What do those mean? How would that understanding radically change views about war and peace, environmental pollution and so on? When I truly feel the ‘other’ and myself as one being, my actions, attitudes, behaviors and relationships cannot stay the same.